Mrs. Vallely is a native of Huntsville, and is a graduate of Lee High School and Vanderbilt University. 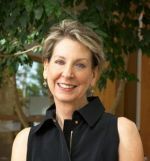 She retired after serving as Executive Director of the HudsonAlpha Foundation. She was the founding executive director of the Community Foundation of Huntsville/Madison County. She has served in the offices of former Congressman Bud Cramer and Senator Jeff Sessions. She has been a high school teacher and a NASA department head. She has also worked in positions that promoted Huntsville’s tourist attractions, preserved its historic sites, and protected the area’s natural environment. In addition to serving on the board for the Alabama State Council on the Arts, Mrs. Vallely also serves on the board of directors for Leadership Alabama (Class 3, Board Chair 2004-2005); Alabama Humanities Foundation (Governor’s appointee, Board Chair 2016); Public Affairs Research Council of Alabama (current chair of Development Committee); Blackburn Institute (University of Alabama); Bryant-Jordan Scholarship Program; Village of Promise Advisory Board and the Huntsville Housing Authority Advisory Board. She previously served as a member of the board of directors of The Nature Conservancy, Alabama chapter, and served as Board Chair 2009-2010. She was in Class 1 of Leadership Huntsville and is a past board chair (1992-1993). She proposed and established Huntsville Hospital’s Community Health Initiative in 1996. Lynne currently works in her family businesses, Berry Millsaps Properties and J. T. Berry, Inc. She and her husband Joe enjoy three children and two grandchildren. Mrs. Vallely serves on the Council's Long Range Planning Committee.